For a woman planning to become pregnant, or one that does become pregnant, the foremost thing that she should do is to ensure her health and the health of her future child through proper nutrition. During pregnancy, it is not always easy to get the complete nourishment needed for optimal mother and baby health without resorting to vitamin supplements. The growth of the developing baby depends heavily on the food and nutrient supplements that the mother consumes before and during her pregnancy. While the role of vitamin K in embryonic and fetal development is still new in the field of fertility research, new studies suggest considering supplementing a pregnant woman’s nutrition with vitamin K.
Vitamin K is a group of similar, fat-soluble vitamins that are imperative for maintaining hormonal balance. The human body requires them to create proteins needed for blood clotting. Vitamin K aids the body in forming proteins for strong bones and tissues by assisting in binding calcium in bones. Chemically, the vitamin K family includes two natural vitamins: vitamin K1 and vitamin K2. In addition, Vitamin K can help regulate menstrual cycles and help the body absorb nutrients. A vitamin K deficiency may cause dangerous hemorrhaging in an infant during delivery. At the same time, vitamin K deficiency also appears to be associated with a higher rate of miscarriage, especially during the first days following conception. 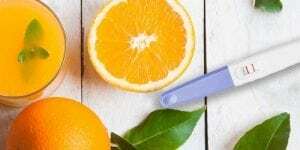 When it comes to fertility and nutrition, this type of K vitamin is gaining more and more interest from couples who are looking to overcome fertility issues and start their family. Fertility depends on factors of nutrition, among others. 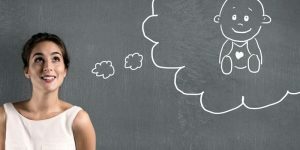 Couples who are generally healthy usually have no problem conceiving. 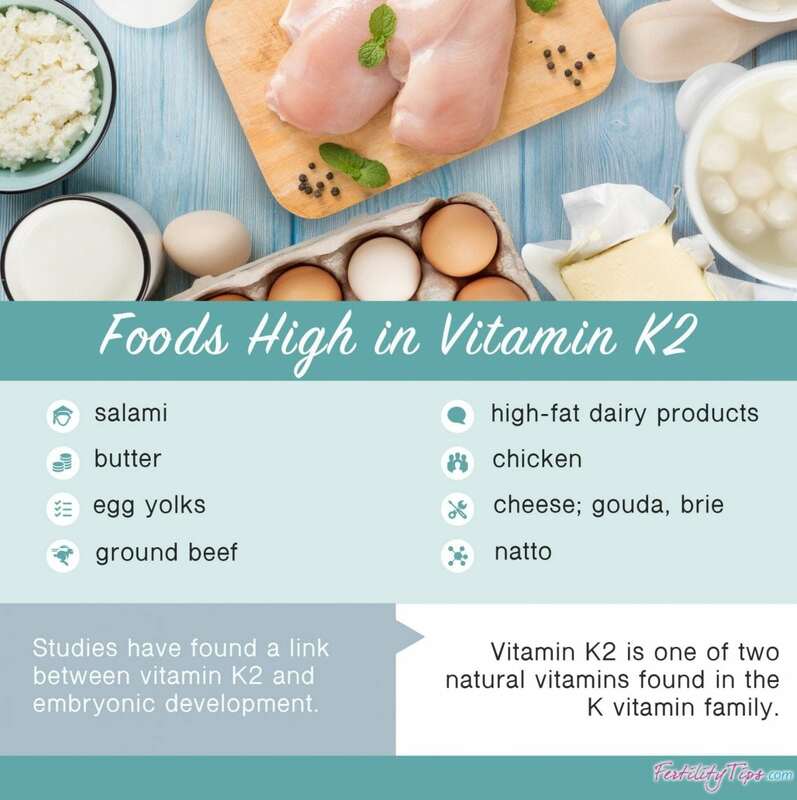 Potential parents planning to have a baby need to make sure they have a nutritious diet, especially one that is rich in vitamin K2. The benefits of K2, while still being studied, is found to benefit embryonic development. 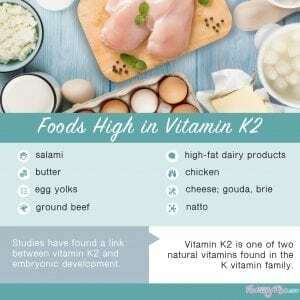 Research on vitamin K2 and its effect on fertility is still in its infancy, but two studies have looked at the role of K2 and the fertility processes. One study conducted in 2014 looked at the link of K2 in embryonic development. Japanese researchers discovered that an enzyme called UBIAD1, which is involved in K2 synthesis, is required for the development of new embryos in mice. The second study, done by Canadian researchers, found that K2 supplementation significantly improved embryo production in cows. Where is it found and how much should be consumed? Vitamin K is found in highest amounts in vegetables such as asparagus, beans, broccoli, Brussels sprouts, cabbage, collards, cauliflower, green leaf lettuce, kale, mustard greens, parsley, romaine, soybeans, spinach, Swiss chard and turnip greens. 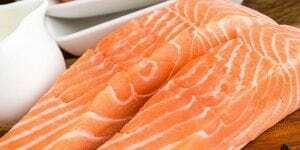 In addition, it is found in fruits such as strawberries and other dark berries, cereals, eggs, fish, liver and meat, dairy foods and natto. The recommended dosage of Vitamin K from food and supplements for women is up 90 mcg/day. 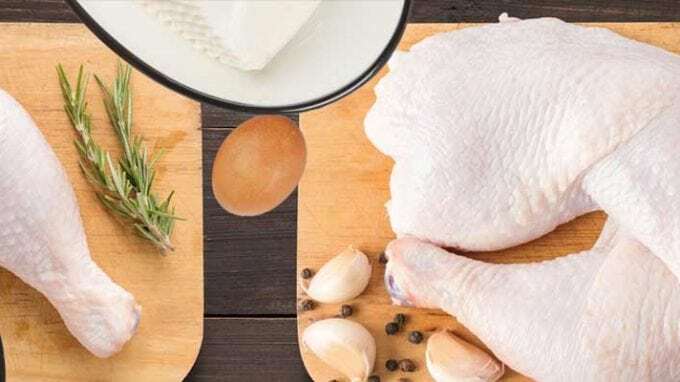 However, getting a sufficient amount of vitamin K2 is not as easy as one may think and many times supplementation is necessary. K2 is found in fatty, cholesterol-rich animal based foods. While there are several vitamins and natural approaches to boosting fertility, vitamin K and K2 are one of the many nutrient options found to help aid in the process.